The TDS ArmGard system provides excellent video enforcement service for Bus Stop Arm violations. 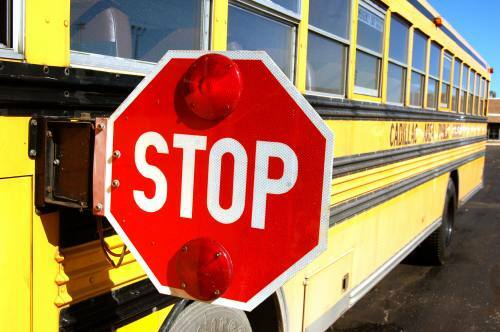 Stop Arms have been mounted on school buses in the USA since the 1950's. Today, Canada and US Federal Motor Vehicle Safety Standard 217 regulate the specifications of the stop arm as a double-faced regulation octagonal red stop sign. When the bus extends the stop arm and flashes red lights (located at the top front and back of the bus), drivers must stop from either direction until the children are safely across the street and the lights have stopped flashing. In most states the law requires a driver to remain stopped as long as the red lights are flashing. Failure to stop may result in being fined up to $1,000 and a one year license suspension. The bus driver is required to monitor who violates the stop arm, which means that in a matter of seconds, he or she must manually record the incident, plate number, location, et cetera, all while trying to monitor children exiting the bus or attempting to cross the street. Typically, the bus driver is the only witness to a bus stop violation. The TDS ArmGard solution removes bus drivers from the enforcement process so they can remain focused on what matters most, namely students' safety. ArmGard is a total solution for the enforcement of the bus stop arm law. A specially designed high-resolution multiple camera bi-directional system is installed on the school bus at an angle that captures any combination of front, side and rear images while the stop sign is extended. The image stream is automatically scanned for vehicles passing the bus illegally. When an offending vehicle passes the bus, the video streams are automatically captured and saved. 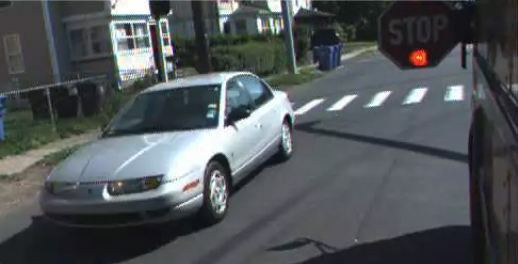 The images include the extended stop sign and the vehicle license plate(s). The violation data is captured and saved along with the location of the bus. It is downloaded either via a 3G/4G network connection or via a wireless link when the bus returns to the bus barn. The downloaded information is transmitted to the TDS violation center for processing where experienced processing personnel confirm that the data from each event is sufficient to support enforcement. Owner information is electronically and securely retrieved. An evidence package consisting of the time, location, video clips, and still images of the license plates and the driver are then sent to the proper jurisdiction for approval by the appropriate law enforcement officials. Once approval has been received, the violation notice is mailed to the offender. The violation notice includes a link to a secure web page where the recipient can review the video clips and dispute the violation and enter a statement explaining why. Disputes along with the recipient's statement are forwarded to the issuing law enforcement officer for review. Disputed violations with reasons which are denied are forwarded electronically to the appropriate court for court date scheduling. A daily report of all confirmed violations is sent to the school.